Happy Wednesday, everyone!! This Hydrangea Blue Dress is one of the newest pieces from my Rachel Parcell collection. It launched last week and is already a customer favorite!!! It is the dreamiest blue dress inspired by blue hydrangeas. 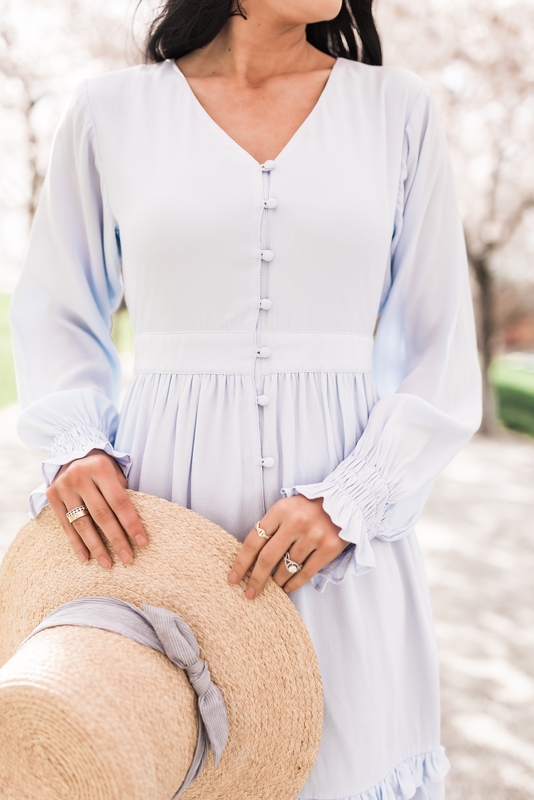 This sky blue color is a favorite of mine right now and I plan to continue to wear it throughout the summer! Above are a few other pieces that have the same color scheme as this Hydrangea Blue Dress!! What’s your favorite color to wear this season?! You are looking so feminine, dreamy and absolutely gorgeous in this outfit! I love your dress! The cherry blossoms and your dress….just so beautiful! That shade of blue is gorgeous!! Light icebleu colour is so DELIGHTFUL for Summer … simply beautiful! ???? Loving this color on you, Rach! Sky blue and periwinkle are my favorites for this summer (: Thanks for sharing! Loving this color on you, Rach! Sky blue and periwinkle are my favorites for summer (; thanks for sharing! This blue dress might be my favorite piece you’ve ever made in your collection! I am such a huge fan of blue and completely love all of your picks! I love all the details from this look! I love the delicate color! The dress is so FEMININE! wow such a lovely blog. I love your outfit collection. Such a lovely dress and beautiful colour!